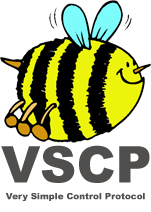 When people ask me what I do I always answer “I am about to change the world” and I have been saying that since August in the year 2000 when the VSCP project was first started. It is fourteen years ago now with millions of lines of code and many, many, many. many… hours of work and the bumblebee is still flying. 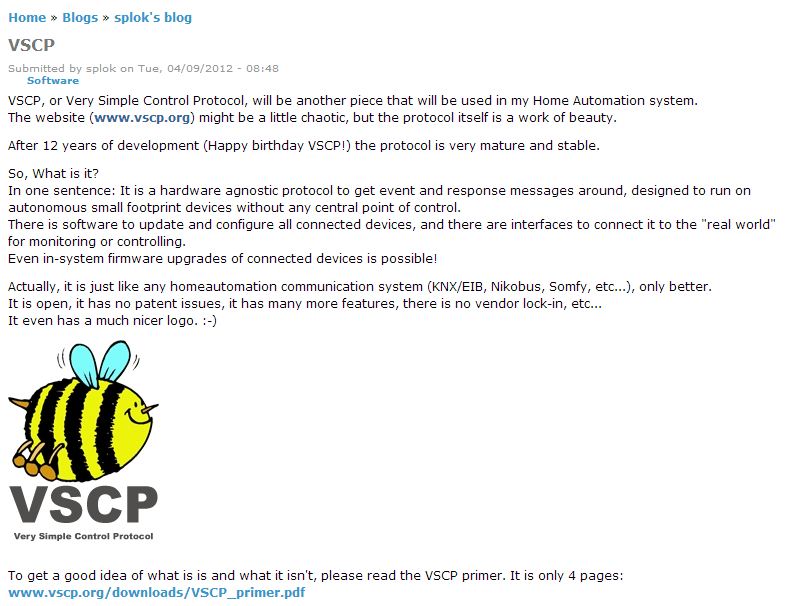 The Swedish companies Ericsson and Electrolux rejected VSCP in favor of OSGi in the first months of its life, but to be honest, I think the real reason for the reject was the chance for the project group to travel to international meetings, but don’t tell anyone. The result, the Screenfridge died and was the joke of the industry for many years. Back then no one was talking about Internet Of Things of course. But the goal for this project has always been the same. We want small low cost things to be able to talk to each other regardless of the protocol they use and regardless if they talk through a cable or through the air or if they are delivered and manufactured by company B or company A. And knowing company A and B and C… we know that the VSCP way of thinking will never attract them fully. They will find there own way, “which is better”, but of course incompatible, but they will anyway. Vertical is the only way for many people to move. So we are happy to place ourselves in between as a hardware abstraction layer also. So if they don’t adopt to the model they can be made to look like they did with a middle layer driver just as HAL in most OS’s of today. We are also , just as anyone else, waiting for “the mighty one” to come and hand the killer solution to us, just as we once got tcp/ip and the packages handed over to us while everyone was busy working with X400/X500. Actually ten fingers plus ten toes isn’t enough to count all of the solutions we have tried to work together with during the years, all without a single exception telling us that they where the final solution. All of them are gone now of course. Gone and forgotten. But the bumblebee still flies, not thinking it was the only solution back then and not thinking it is now. But of course, for us a tiny device can be really tiny. Having almost no resources at all. A device that think something like a string is heavy stuff. Silicon even. A tiny little thing that still wants to send a measurement value to the world. Something important maybe. So I started there. Tiny things, larger things, and really big things should all work in the VSCP model . It is easier for the big to adopt to the small then vice versa. So I made the model around that. Uniform device discovery and identification. A uniform way to update/maintain device firmware. so I attended meetings and tried to present the solution, but of course there was always a big company that just started a multibillion dollar project (or a government financed project for that matter) that would solve this thing once and for all. Common for them all is the belief that everything have one megabyte of flash at least and endless amounts of ram and a radio transceiver that does not even need current and of course all of these small devices is like small humans, even Facebook embraced all this and told the world they will build a Facebook for machines and soon Twitter will come and…. And the stupidity just goes on an on and on and all the tiny things are just left out. The tiny thing that counts for at least 90% of the estimated billions of devices everyone is talking about. The things that have 200 bytes of ram and less and maybe even is just silicon. So I entered competitions. Did not win of course. Did not even get any attention. Probably no one even read the documents. There contain to few pictures of hot homes controlled by Nest’s and Ipads and IoT is not in capital letters all over the pages. And this is not a solution coming from a big company or a well known institution. So one day there was a IoT competition in Eindhoven in the Netherlands. Famous for being Philips home town. The tree top participants got a free ticket to the event and a chance to win a prize. So I asked all my friends to vote of course, everyone else did, and VSCP was finally chosen as one of the tree selected (there was not that many participants). OpenHAB, a home automation project, based on OSGi (!!!) got most votes, and then came the VSCP project and last a project called The Incredible Machine. There are some info about the event here. At the last day of the event and because it was only three participants we ended up at place tree and I got two size small t-shirt as a price. A Dutch joke maybe as I am a +110 kg person!? But if there had been four entries or more we would not even been among the three winners. Why is that? Is it because VSCP is totally useless. No I’m sure the judges on this event as on every other IoT competition just like good looking (but pretty useless) things and gadgets, gadgets, gadgets and never ending toys. They don’t even understand the things that are needed to get this thing IoT everyone is talking about going. Actually most of the people working with it is utterly fools that should be put back to kindergarten at first possible chance to do so. Most of the stuff coming up is just a joke IMHO. Yes a JOKE. So did I stop to say “I will change the world” after this? Noop. What is fourteen years of hard work without anyone even notice you are there. If you feel in your heart that something is right it probably is. Ask Mr. Tesla… Oh well it could be hard, but if he was around we would have told you. So I move on. and you understand that at least one person has seen the beauty of VSCP and you which more people did. And you see Alljoyn an other projects getting started from scratch and they have never ever taken a look at what’s already available. People don’t do that anymore. I would be utterly surprised if anyone of the Alljoyn alliance ever cared to read a page of the VSCP spec. But they think I should read the documents of course and as all the other projects that has been there for a while and then disappeared even without a small amount of smoke remaining after they are gone they will probably finally also vanish into the air. Or maybe set a standard for IoT things. For the big things. With huge memory, power and glory and pride and a horn to beep with. Less then ten percent of the devices. to that. And please understand that I am the bumblebee that WILL change the world. And I am just utterly happy trying to do that. Greetings from Australia, i am really hoping to make contact with Johan Breaken from http://www.splok.org. I have tried unsuccessfully to find the Contact details on this gentleman’s website but for some reason this is not displayed there at all. They require a logon detail and i presume that the Register page is not there either as i cannot logon with out being registered. My question is in regards to the Temp Sensor Interface..? If someone can kindly pass this on to Johan i would really be appreciative. OK I don’t have that info but I hope someone else reading this have.